I know I have told you time and time again how much I love, love, love lifting heavy weights. For so many reason, I just love it! Today I thought I would just share with you one of my all time, hands down, fave pieces of gym equipment I own. 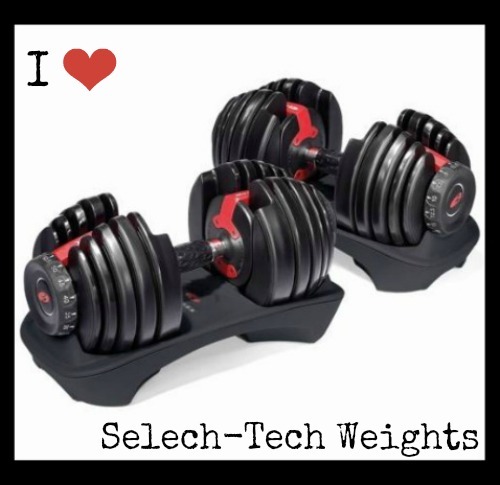 My dearly loved, Select-Tech Weights. I can honestly tell you these weights have helped me increase my strength and fitness just for how convenient they are to have on hand. For me convenience is key. Knowing I have such a wide variety of weights on hand ready when I need them is huge. Being able to switch up my resistance amount allows me to change up my workouts, keeping things interesting so I don’t get bored and neither does my body. Not having to drive to the gym and stand around waiting for the weights I want/need to use only to find one is missing and then having to spend/waste another 5 mins hunting down it’s buddy . . . seriously annoying. “Ain’t no body got time for that”. These weights are awesome. Such a worthwhile investment. Now, I say investment because yes they are a little pricy but totally worth it. Each dumbbell adjusts from 5 to 52.5 pounds (2.27 to 23.8 kg) ; the weight increases by 2.5-pound increments up to the first 25 pounds. This is so helpful whether your just starting to lift weights or you have been lifting for a long time, such a variety of weights means you can increase your load to match your increasing fitness levels without having to go out and buy another set of dumbbells. It is 15 sets of weights in one neat little bundle, hello huge space saver! I live in an apartment so this is huge for me. Not to mention that I have a little one to live with . . . how do little ones have sooooooo much stuff?! Anyway, not only do they save space but it eliminates the ability to lose one weight. Nothing worse than going to do your workout and one of your dumbbells is missing right?! This way you will always know where your weights are no matter what! They are cheaper and more convenient than any gym membership and you get to keep them for life. Breaking the cost down into dollars per use has them practically costing pennies per use. Not to mention that they are right there,on hand, at all times ready to work. No excuses right?! They are unisex. 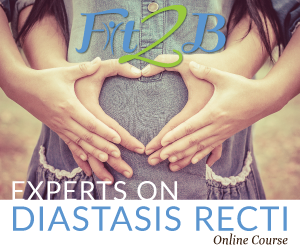 For those of you who are wanting to get your husband/wife/brother/sister/mother/father in on this health and fitness journey with you this is also pretty handy. Im pretty sure my spunky husband much prefers working out with these babies as opposed to the pretty pink dumbbells I owned back in the good old days . . . Anyway, sharing is caring people . 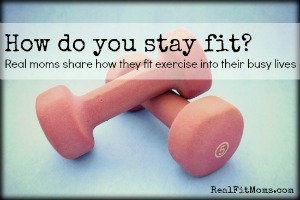 . .
Do you have fave piece of workout equipment you simply can not live without?